The time frame for improvement is also variable, depending on the degree of myopia. Children with low myopia could invariably improve the quickest if they were under twelve years of age and had never worn glasses. In most such cases, Bates found that the children could return their eyesight to normal within a year or less. For adults who’ve worn glasses for a number of years and have higher degrees of myopia, it will take a considerably longer time period, such as the seven years in Orfield’s case. She warned her patients embarking on myopia reversal that it would be a long and slow process to achieve normal acuity as she did. When Bates had moved back to New York, he started a similar myopia reduction program in five public schools, with a participation of 5,700 students. Only students not prescribed glasses were involved in the program. They were taught to practice reading a familiar Snellen eye chart (such as the one shown in Figure 5.1) silently at their desks each day. The goal was to learn to prevent straining so as to better see objects at the distance. Ordinarily, the children would strain to see unfamiliar objects, such as writing or figures on the blackboard, maps, diagrams or pictures. Such strain would induce a myopic change in their acuity and, over time, low levels of myopia would gradually settle in rather than stabilizing back to normal acuity once the strain to see was gone. 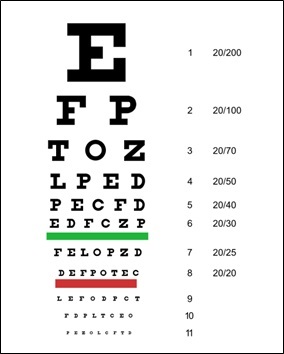 Figure 5.1 Snellen eye chart for testing visual acuity. The ability to read all the letters in line ‘8’ from a distance of 20 ft. signifies 20/20 vision. Being able to read only line ‘1’, the big ‘E,’ from 20 ft. would signify 20/200 myopic vision. The teachers were taught how to test and record the vision of the children at different intervals throughout the school year using a Snellen eyechart from a distance of twenty feet. An unfamiliar chart was used for each test — not the one on which the students had practiced daily — so that the students wouldn’t have memorized the letters. As well, schools would request an objective medical examiner from the health department to occasionally test the students and verify the recorded results. A considerable reduction in myopia occurred as noted in Figure 5.2. 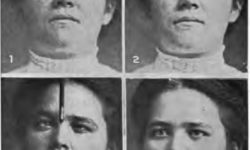 The successes of both the Grand Forks and New York programs were documented in the New York Medical Journal. Figure 5.2 – In the 1913 New York Medical Journal, Dr. Bates described the successful natural myopia improvement program he initiated at five New York City schools. Bates documented other successful case studies too numerous to mention in this article. His natural methods for relieving eyestrain were successful for improving other conditions, such as astigmatism and presbyopia (old age sight). As well, he recommended eye movement re-education instead of surgery to treat people with strabismus (misalignment of the eyes). The remarkable photos in Figure 5.3 are one such case. The girl was a patient of another ophthalmologist who was planning surgery and consulted Bates for his opinion of which particular muscles to operate on. Instead of surgery, Bates recommended eye re-education which he initiated and instructed. The other ophthalmologist continued the treatment and successfully corrected the girl’s strabismus in that manner within a month. Figure 5.3 – Circa 1903-1910. A girl with divergent strabismus (misalignment of eyes) was considering eye surgery. Her condition was corrected within a month by re-educating various motions as taught by Dr. Bates. 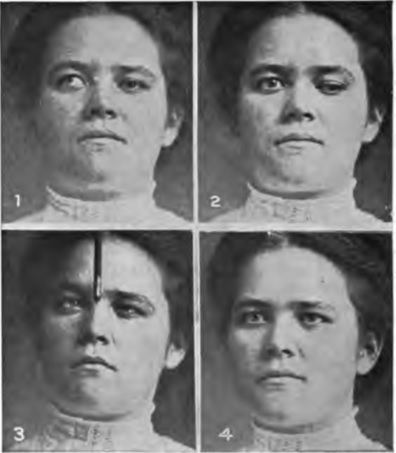 The four pictures were taken within fifteen minutes of one another at one stage of the treatment. “The fear that there will one day be established a despotism based on science is a ridiculous and absurd fantasy.” So claimed a social theorist who, in 1819, foresaw a trust towards scientific leaders totally different than towards the previous theological leaders. Over two centuries of trust in vision scientists has led us to the sorry state we face today — a worldwide myopia epidemic that continues to escalate each year. The current intellectual leaders in vision wring their hands, confused and helpless over the cause and cure of myopia. Cast adrift with recycled and worn theories, they can do no more than offer the trite recommendation — “more research is needed.” More research down the same dead ends is the ridiculous and absurd fantasy. The greater absurdity and tragedy is that the myopia boom is largely an iatrogenic outcome of the large scale prescribing of concave lenses as the standard treatment. The endless struggles in myopia research to find answers and a solution are indicative of the inherent difficulty within the scientific method itself. Reductionist, mechanical science as applied to the material world has its limitations when studying the human being. Such specialist science, parceling out multitudes of individual body parts which supposedly have clearly defined boundaries, is utterly lost when it comes to the holistic nature of vision and the integration of the senses and psyche. Natural vision improvement (NVI), the proven alternative which embraces holism, offers a method to control and reverse myopia for those so inclined. The article in the next blog post, “Optometrist Cures Her Own Myopia,” discusses more about Orfield’s success story in relationship to some NVI fundamentals. Her high profile case is simply one of many success stories since Bates’ time. 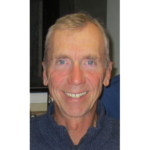 See David’s post, Bates Method Success Stories, from November 17, 2016 for further details. Critics can condemn and ridicule Bates and NVI to their heart’s content, backed only by their delusional scientism and hubris, but they can’t argue with such successes. Even a supposedly progressive eye doctor, called a neurodevelopmental optometrist, doesn’t believe myopia improvement is possible. His research has included the role of stress in the onset of myopia, yet he flat out states that it is incurable. “Can myopia be reversed? Unfortunately, no.” Obviously he hasn’t seen any successful cases. It does not seem to me that a doctor is justified in telling a patient that he is incurable just because he has never seen such a case cured … This may cause the patient to accept as inevitable a condition which might have been cured, and may even prevent Nature, because of the depressing effects of discouragement, from doing what the doctor has failed to do. W.H. Bates, The Cure of Imperfect Sight by Treatment Without Glasses, (New York: Central Fixation Publishing Co., 1920), 101. Antonia Orfield, “Seeing Space: Undergoing Brain Re-Programming to Reduce Myopia,” Journal of Behavioral Optometry 5, no. 5 (1994): 130. W.H. Bates, “The Prevention of Myopia in School Children,” New York Medical Journal 94, no. 5 (July 29, 1911): 237. Bates, The Cure of Imperfect Sight by Treatment Without Glasses, 259. W.H. Bates, “Myopia Prevention by Teachers,” New York Medical Journal 98, no. 9 (August 30, 1913): 410-413. The pie charts in Figure 5.2 were created from the data within the source listed in note 39. Bates, The Cure of Imperfect Sight by Treatment Without Glasses, 228. Henri de Saint-Simon, quoted in Theodore Roszak, Where the Wasteland Ends: Politics and Transcendence in Postindustrial Society, (Garden City, NY: Anchor Books, 1973), 26. Merrill Bowan, “The Myopia About Nearsightedness, I. The Cure For Myopia,” http://www.nb.net/~sparrow/myopianear.html. I am glad that I found out about NVI and was openminded enough to try it and see for myself that it works. But I doubt that NVI will catch on any time soon. Proponents of NVI may have truth and facts, but for most people propaganda and authority are much more convincing than truth and facts. Spot on, Dr. Cyber. NVI has been marginalized and mocked for over a century. Who knows, NVI proponents may be considered nut-jobs for another century. That’s why my articles wouldn’t stand a chance of getting published by a mainstream magazine. Congratulations on your open-mindedness and awareness of the truth and facts with NVI. As the old saying goes, the proof is in the pudding. Previous Previous post: Why Is The Eye Chart So Clear?